Seasonal Occurrence: Rare September through May. Greatest likelihood during spring and fall migration. 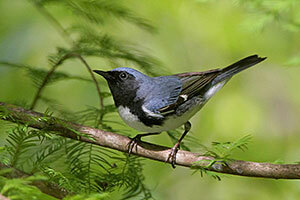 Notes: Although rare in our area, Black-throated Blue Warbler populations appear to be stable. This species prefers dense thickets and woodland understory. Males are so dark, they can appear almost black in the shade. 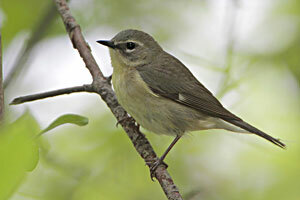 Females are olive-green with thin white stripes over the eye and a white wing patch. Sometimes females display traces of blue on their crowns and upper tail coverts. Song: a lazy zwee, zwee, zwee, zwree, with the last note higher pitched.